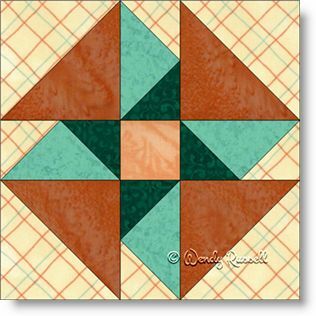 The Spinning Blades quilt block is a great starter block. It is simple to construct and introduces you to the half square triangle patch (the most commonly used patch other than a square) and, my favourite patch, the flying geese unit. This five patch block (so named because it is designed on a 5 x 5 grid) is constructed as an uneven nine patch. Both of the sample quilts illustrated use an on point setting for the blocks, but you will notice that they are quite different. This is what makes quiltmaking such an interesting craft -- you can do such a variety of things with the same blocks to make a totally different quilt!